Augmented Reality (AR) refers to the integration of digital or computer-generated information with the real-world environment to provide an enhanced version of reality. Here, it is important to differentiate between Virtual Reality (VR) and AR. VR creates an artificial environment. AR, on the other hand, enhances the real environment for more participation, immersion, and interaction. In the era of digital, where a majority of school-going kids having access to smartphones, AR is making deep inroads in education, making studies more interesting, immersive and contextual. Here we list some ways by which AR is transforming the classrooms. Using AR apps on their phones, students can bring alive the lessons in their textbooks, that is, if the books have been AR-enabled. So what is an AR-enabled textbook? Basically, digital publishers can add AR features to their books to provide context. For example, a lesson on an artist can have AR features, such as a gallery containing the works of the artist and some information about the era in which the works were created. When the students point their AR app on their phone to the lesson, they will be able to see the gallery and thus, gain more insight into the artist’s life and works. The other benefit of this is that with AR features already embedded in the books, the teachers are spared the hassle of creating their own audio/video materials to supplement their lessons. AR-enabled worksheets enable students to learn independently in the comfort of their own homes. In the digital age, it has become very difficult to engage students with static content. AR-enabled worksheets make homework both easy and interesting. The students just need to point their AR-enabled mobile phones on their worksheets, and the app would launch corresponding digital elements, such as video, quiz, map, podcast or virtual representation of a 3D object. Students can thus, browse through a host of contextual digital material, learn at their own pace and try the various activities and learn by doing. Another innovative use of AR in the classroom is to create Word Walls to enrich the vocabulary of students. For example, the wall can contain a list of words to be taught. With the help of AR, students can view their meanings and examples of their use. There can be similar walls for other lessons as well, for example, in geography, the wall can have pictures of planets and the students can use their AR app to view audio/videos and other 3D elements to learn more about them. How to create AR-enabled content? 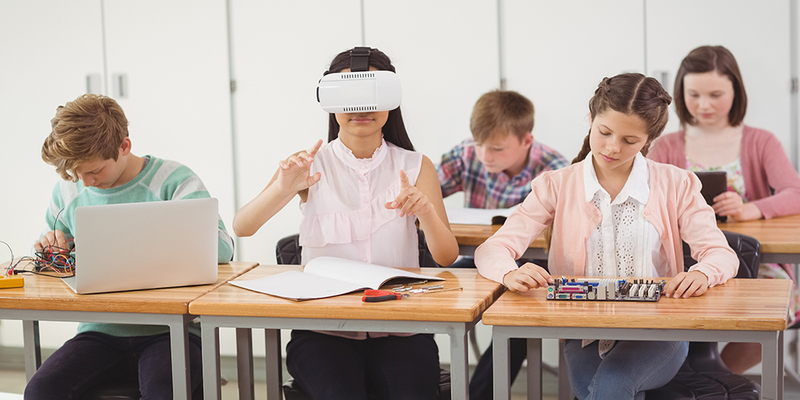 In the era of rich digital disruptions, digital publishers can up their game and entice their young learners with AR-enabled eBooks and learning material. There are several digital publishing platforms that allow publishers to create AR-enabled content. They simply have to upload their PDF files and then follow steps to add AR elements to the text to make the content more interactive. While there are many digital publishing software available, you may wish to consider Kitaboo, an award-winning, cloud-based, proprietary digital publishing software from Hurix Digital. Kitaboo simplifies the process of not just creating e-learning materials but also adding AR elements, and then distributing them to the end-users, efficiently and cost-effectively.